Wordle is one of many tools for generating word clouds. A word cloud is a visual depiction of a collection of words. It’s easy to create a word cloud by pasting in a chunk of connected text or inputting your own words into an online word cloud generator. The generator then creates a picture, with the words that appear most frequently in the text having greater prominence in the word cloud. You can even manipulate the font, shape and color schemes of the cloud. 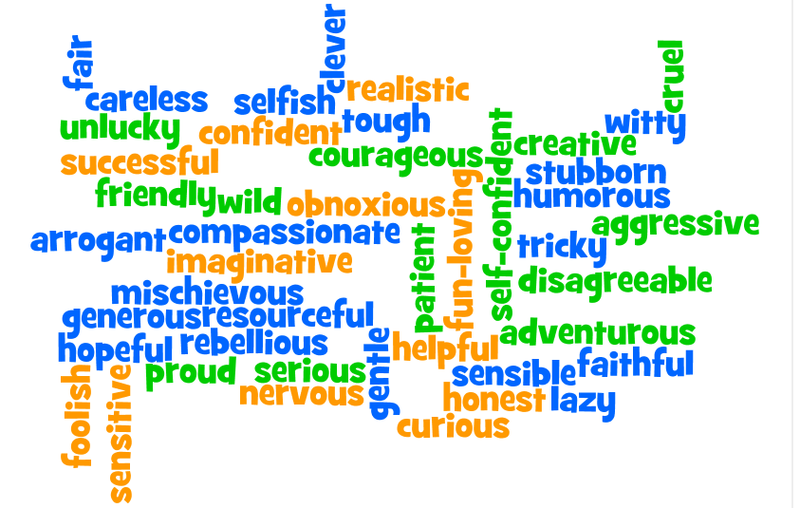 On the left is a word cloud of 45 WORDS THAT STUDENTS CAN USE WHEN TALKING OR WRITING ABOUT CHARACTERS IN THEIR READING. Scroll down for 10 more ways to use word clouds in the literacy classroom. Vocabulary Clouds: Have students choose 20 key vocabulary words from a fiction or nonfiction reading passage to create a word cloud. Then use at least 10 of them in a summary of the passage. Synonymous Words: Brainstorm synonyms for “tired words” such as went or saw. Use the word cloud as an anchor chart for student writing. Prediction: As a prereading activity, create a word cloud of key vocabulary from the passage and invite students to predict or anticipate what the passage is going to be about. Word Explosions: Use word clouds to create “word explosions” by brainstorming other words built from a particular root word. Word Sorts: Sort a collection of words from a reading passage into groups, such as similar meanings, parts of speech or letter patterns. Introducing a concept: Introduce a new theme, concept or reading passage with a word cloud and have students generate questions about it. Learning Review: As a learning review, have students work in pairs to create word cloud riddles of about 10 words on a concept, repeating the most important words to make them large. Other students must guess the concept. Summarization: Input a short news article into a word cloud and have students summarize the gist of the article. Assessment: Help students understand assessment criteria by converting a rubric into a word cloud and having students analyze the most important criteria.